Today was SUCH a busy day! There's a lot to read today, but I promise you that reading to the end is 100% worth it. Would I lie? I spent much of the morning working on Gavin's bed situation. I was on the phone with our insurance for quite a while trying to get the status and explaining the necessity of this bed to everyone who would listen. Then I started to work on the letter of medical necessity. I only got through the fist paragraph. Technically, a letter of medical necessity is written and signed by the doctor. But truthfully, I have written every single one over the years. (I highly recommend that to everyone) I know all the facts and it saves everyone so much time for me to just crank it out. Then I hand it over to the doctor - they copy it onto their letterhead and sign it - and Voila! But that's our little secret, okay? And about this bed I want for Gavin...I've gotten a lot of mail with questions and some outrage as to why the bed is so expensive. I plan to do a post someday soon on the prices of all things "special needs" - you will be very surprised. I've done my research and this bed is actually one of the cheapest (price-wise) out there. Some go upward to the $20,000 range!! And those, quite frankly, look like they belong in a Russian Orphanage. No offense to any Russians or Orphanages. So, after my busy administrative morning...there was a knock on the door that brought me out of my insurance induced fog. It was Miss Jen!! 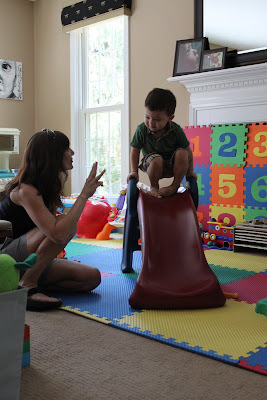 Today was Brian's first day of Speech Therapy! 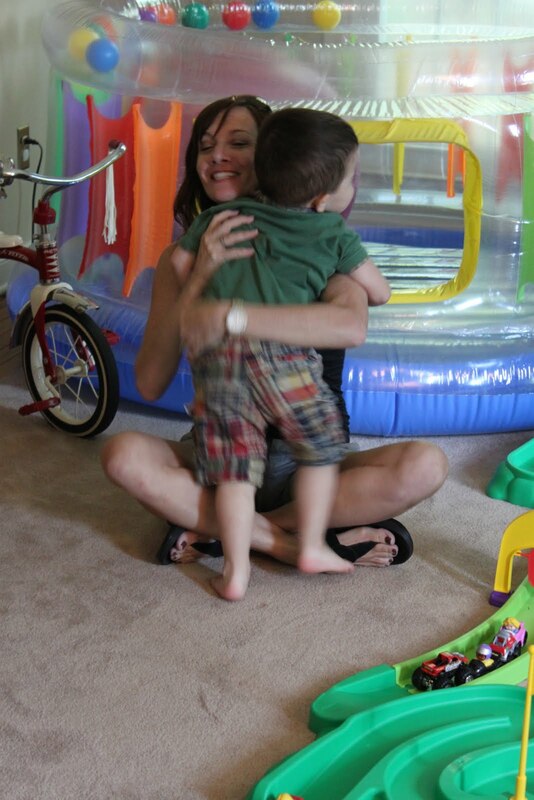 It was so nice to see Jen - she has known us since Gavin was an infant and she was HIS therapist. Brian warmed up to her instantly...I'm sure he remembered her. They got right down to the business of playing together. She pretty much let him do his thing and found opportunities to help him communicate while he was playing. 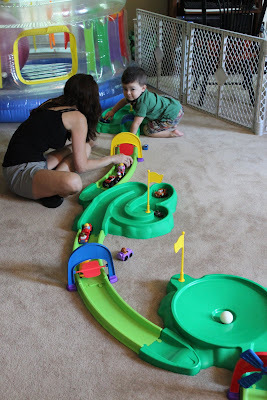 We use the course to roll cars and balls in the tracks for now which is super fun. Especially with Matchbox cars - they go fast! 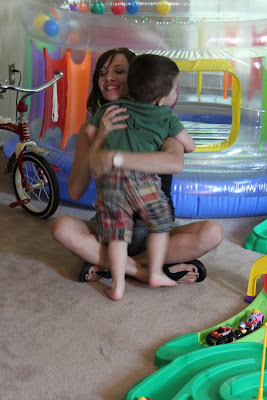 Miss Jen and Brian had fun racing the cars and she encouraged him to say "Zoom" and "Go". By then it was nearing the end of the hour and I could tell Brian was running on fumes. The entire session he was a jumping bean - super hyper - even doing things that aren't typical and aren't necessarily appropriate (like throwing things at us). Kids always make liars out of you - it was only 40 minutes earlier that I was telling Jen what a good boy he is. Ha ha! But all in all, he was a good boy and as you can see...he was in love with Miss Jen. The boys got in their highchairs for lunch and I couldn't resist taking a reunion picture. Jen left me with the advice to "Hold Out". At first I thought she was giving me marital advice - but came back to Earth and remembered that this was about Brian. She said to wait if I know he can use a word for something. For example, when I know he wants more of something - I shouldn't give it to him without him actually saying (or trying to say...or even signing) "more". It's so nice to have you back "in the family", Miss Jen! After lunch, Gavin went down for a nap and Brian and I took a little road trip! I wanted to bring dinner over to my parents. It just so happened that today was my Mom's "Mahjong" game, which she was hosting. My Mom, my Aunt Mary and three other women have been playing this game as long as I've been alive. That's a long time - over 40 years! Every week they rotate to one of their houses - play the game for coins and then eat dessert. In all these years, I've never learned to play the game! I'm always so happy to see the ladies. There's my Mom, of course, Mrs. Fazio who lives nearby, Mrs. Gallagher who lives down the street, Mrs. Chaloult who was also on our street and my Aunt Mary! These women have seen me grow up...come to my graduations...my wedding...they ALL might as well be my Aunts. I love them all very much. On the ride home, I could tell that Brian was exhausted. How? Because he stops caring when we pass by a flag. I thought - this is the day to try his big boy bed for a nap. I was running a little late so, unfortunately, I got home at the tail end of Gavin's feeding therapy. I got the report from Miss Maggie that Gavin did a great job crunching on fishies and potato stix, but hated the cold carrot sticks. We said goodbye and I took Brian upstairs to his room. We both got into his bed and he instantly got under the covers and pulled them up to his chin. For two seconds. Then he got up...crawled to the end of the bed...got down using the step stool...grabbed some books...crawled back up...repeat. So I decided I would pretend I was sleeping - thinking I would model what he was supposed to do. That's when he decided to get one of his favorite books - one that happens to be about 15 pounds. While I was fake sleeping, he accidentally dropped it right on my temple. Big bruise coming soon. I bagged the whole idea and put him in his crib - where he promptly fell asleep. I need to research strategies for helping him adjust to his new bed. I'm open to any tips or tricks from all of you! While I sat and wrote my journal today, the phone rang. It was a nurse assigned to the claim for Gavin's bed. We talked for quite a while and I explained why a bed like this is necessary for Gavin. How he has no sense of danger...how he mouths everything and this bed doesn't offer anything to bite...how the other beds aren't enclosed and he could easily fall out...how this bed is actually one of the cheapest on the market...how he currently gets his legs stuck between the bars on his crib - and would with the other beds out there that have slats...and on and on and on. I told her everything I would have included in my letter of medical necessity. She said she would do some of her own research and get back to me. I continued to type about Speech Therapy and Mahjong when the phone rang again. "Mrs. Leong, this is Peggy from United Health Care. I am calling to tell you that your son's bed has been approved." Gavin will get his big boy bed!! What a way to end the day. Woo-hoo! We are on a roll for good news. Praying it continues for you and your family, Kate! Way to go on the new bed. That's great news! Don't get discouraged with Brian not sleeping in his bed yet. It's HUGE to him and may not feel just right yet. It took my kids a while and they were a bit older. Give him time. My kids sleep on twin mattresses. We don't have room for fulls so Brian is one lucky boy. Also, we used to have United Healthcare. They didn't ever approve anything for Curtis or for my ongoing care. You are soooooooooooooooo lucky they are approving things for you. Finally, something you don't have to fight tooth and nail for - GREAT NEWS!!!!! Things will "click" with Brian on speech and the big bed - you'll see. Congrats on Gavin's bed!! That's awesome!! Here's something to try with Brian. I took an inexpensive sheet and ironed his favorite thomas trains (I printed it out from a pic on the internet onto the iron transfer sheets, available at staples or any crafts store) onto it right near his head, below where the pillow would go. (I didn't want to buy character sheets that didn't match the room.) Alec used to love lying down next to it and he was a hard one to get to sit still!!! Good luck!! !